The Sangean PS-300 is a simple, inexpensive, popular option that will suit most users’ needs. It can be used with any portable audio device (iPod, iPhone, iPad, MP3 players, smartphone, radios, TVs) as long as it has a 3.5 mm headphone jack. The volume control is a nice distance away on the cord from the sound source. The cable is 6.5 feet long. The speaker is very flat with only a 0.5-inch thickness. This model has a loud volume amplifier, so you can get it louder than most other speakers in this price range. It comes with a one year warranty. The PS2 SoftSpeaker Pillow Speaker is designed to sit on your pillow rather than underneath it so you are able to hear the sound more clearly without having to increase the volume and disturb your partner. 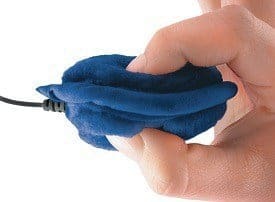 It has a standard 1/8″ headphone jack and comes with the speaker covered with soft, padded foam and a plush, removable cover that you can wash. If you would prefer your speaker to be inside your pillow, you may want to have a look at this pillow from Conair. 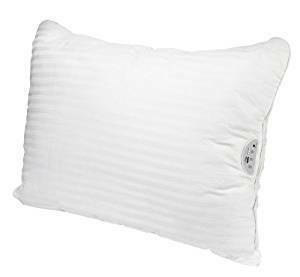 The pillow has a 100% cotton cover and is filled with 100% polyester. This pillow is a little different because not only can use plug your phone or MP3 player into it, it also comes with 10 built-in sounds (heartbeat, number of different nature sounds and white noise) to help you rest and relax. It has a 15, 30 or 60-minute timer and runs on 2 AA batteries. volume by reaching under the pillow to change it. The Pillowsonic has two digital micro-speakers that can work well even for dense cushions like memory foam. 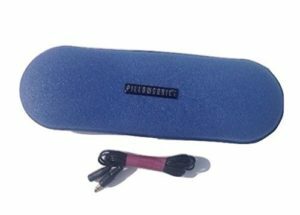 The device itself has an acoustic foam outer shell so that it won’t slip around under your pillow like some of the hard case models and it should be comfortable under or on top of the pillow or between the top of the pillow and the pillowcase. It comes with a one year warranty. Obviously, the CozyPhones are not pillow speakers, but I thought I’d include them as an alternative since they market themselves as being a good headphone to use for sleeping. They are very popular and you can use them for other things like exercising or traveling. This design has thin 1/8″ cushioned, removable speakers that have a 52″ braided cable. The headband is lightweight and washable. A built-in mesh lining helps the speaker to stay in place while you are sleeping, even if you move around a lot. It also has a 3.5 mm stereo plug and comes with a 100% money back guarantee. Generally, pillow speakers are not known for being the best quality or for working all that well. It can be challenging to get a product that lets you hear clearly while your partner doesn’t hear anything. To try to help you get a device that will work well for your needs, there are a few features to consider when shopping. Volume Control – Volume control is an important feature on most speakers in general, on a pillow speaker you want to make sure it is close enough to the actual speaker (but usually not on the speaker itself) so it isn’t a hassle to reach and adjust while you are in bed. A good length to look for is to have the volume control around 12 inches from the sound source. 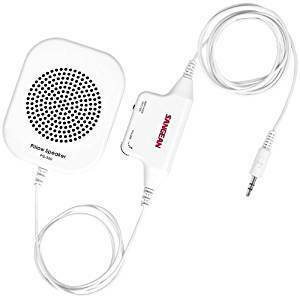 Devices you can use pillow speakers with– You should be able to use a pillow speaker with any device that has a standard headphone jack, this will include things like MP3 players, bedside radios, or cell phones. Wireless Bluetooth – If you are looking for a wireless Bluetooth pillow speaker, there aren’t too many that include this technology. One company called Dreampad offer a pillow that is Bluetooth. Design- Most of the inexpensive pillow speakers are the same type of shape of a small, round or square shaped speaker that you place under your pillow. You can also get designs where the speaker is inside your pillow (you buy the whole pillow). 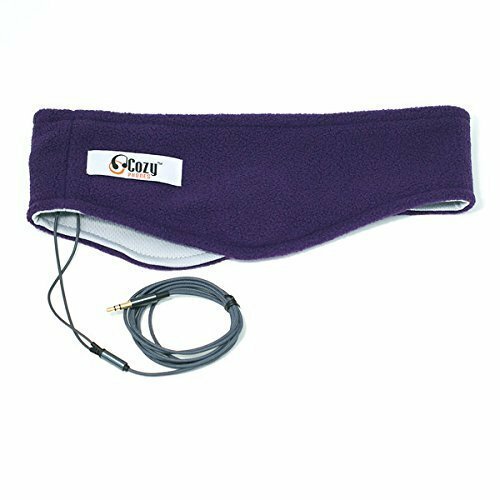 Another top-rated product that we have listed is the headband style that is comfortable to wear while you are lying down and allows you to hear the sound. Will the speaker work with your TV- Since most of the inexpensive speakers are wired and not wireless, you can use them with most televisions, but you may have to purchase extra products for them to work. Most pillow speakers’ work by being plugged into a headphone jack, most modern TV’s don’t generally come with a headphone jack so you could try getting a conversion cable that would allow you to do this. If your TV has a Bluetooth signal, you could look into getting a Bluetooth receiver that has a headphone jack and then plug the speaker into the receiver. Power Source- Most of the pillow speakers run on the power source of the music/sound source (cell phone, radio, etc.). Some also run on batteries. Volume level– If you have a memory foam pillow you will need to look for a speaker that is loud enough to get through the foam, or avoid the under pillow speakers and go for the C Crane that sits on top of the pillow or the CozyPhones that you wear. You also need to be able to find a volume level that you can hear that your partner won’t be able to hear, this can sometimes be a little easier said than done. Sound quality– Unfortunately pillow speakers aren’t really known for their sound quality. If you are very particular about sound quality you may need to come up with a different solution for listening to music with your head on a pillow. For most people though, pillow speakers will provide an adequate sound that is clear enough if you are listening to words or for music. The sound quality will also depend on the volume that you set the device at as well as the thickness of your pillow. To get the best sound quality with speakers that are under the pillow you will need to make sure the speaker is directly under your ear, it will be louder and more clear. If you are concerned about being able to hear properly, have a look at the C Crane or the Cozy Phones since you don’t have to worry about sound being muffled as it travels through the pillow. Length the cord– Depending on what you are using the speaker with, you may want to note how long the wire of the speaker will be. You can get products that have cords as long as 6.5 feet. Material – Since the speakers come in all sorts of different designs, you can get them with a lot of different types of materials. Most basic under pillow speakers will be made of hard plastic. The C Crane has foam padding around the speaker and a plush cover. The pillows that have the speakers built in, come with a standard cotton pillow. The Cozy Phones come in a fleece or a Lycra mesh.